Marian art carries hidden symbolisms that most people have no knowledge of. Fr José Silveira SJ, in his talk at Thomas Stephens Konknni Kendr, Porvorim, elucidated the reasons for the changing artistic form of Mary through the ages, in keeping with the historical context and the societal attitudes towards women during various periods. While appreciating Marian art, we must bear in mind two facts about Mary: there are no physical relics of her present and Mary is considered the link between the divine and the human. The Roman Catholic perception of Mary has always been one of the spotless virgin; one whose image is not to be worshipped but venerated. Mary’s images seem to depict that intimate relationship with heaven, reflected onto earth, with that tenderness of a mother that appeals and draws people to her. The images, in fact, supply messages through symbolisms for those who have little or no education and are unable to read. ‘It is a book of communication for the unlettered,’ says Fr José. Marian art has connotations attached to the symbols, as in flowers, fruit, colours, etc, that appear in it. The white lily represents Mary’s virginity, with the white petals representing her pure body and the anthers that emerge from the centre of the flower symbolising her soul’s radiance. The rose is an emblem of Mary’s love for God and the pear appeared in different artworks, denoting the ‘fruit of the womb’. The use of the apple in Marian art acknowledges her as the new Eve. Almonds symbolise divine favour towards Mary and twelve stars around her head usually represent the twelve apostles or her own glorification/ victorious self. The colours that are used have their own significance: the gold (eg the halo) used is symbolic of her glory likewise her royalty; pink is for her eternal innocence; white represents her purity; red signifies Mary’s humanity while blue denotes her connection with the divine. The catacomb art of the early centuries: There is a legend that tells of St Luke visiting Mary after Jesus’ death and of her asking him to paint her with baby Jesus and to include in the painting a table made by Jesus. She also revealed many details of her life to St Luke which he incorporated in the painting. This is, supposedly, the earliest representation of Mary. Another legend, of the fifth century, claims that the Magi brought along with them an artist who captured the scene of the Nativity with the Magi. On their way back, they left this painting in a Persian temple in honour of the Holy Family. 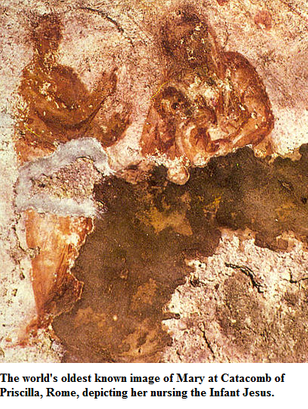 Catacomb paintings came into being owing to the persecution of Christians. The catacombs were the only place Christians could safely express themselves. The Catacomb of Priscilla has one of the first known representations of Mary, dated late 1st century – early 2nd century. It shows Mary nursing baby Jesus with Isaiah, the prophet who foretold Jesus’ birth, on the side. Here Mary becomes a figure of comfort to persecuted Christians. She is seen wearing the garments of a Roman mother with a veil over her. The veil was worn by devotee virgins during that era. Many of the pictures of Mary have her seated with Jesus. These pictures depict her as the presenter of a new religion, the presenter of Jesus who proclaims the new faith. It also means that she is the Church, the body that gives us Christ. Her victory and royalty is denoted by the sitting posture as well. Patristic period: A great amount of artwork with Marian themes presents her as the virgin mother. She is depicted as a beautiful, young maiden to focus on her virginal motherhood. This is linked with the Burning Bush that remained alight yet was not consumed: Mary gave birth but her virginity remained untarnished. Mary is once again projected in this age as the New Eve who restores mankind’s relationship with its Maker with her acquiescence to be the mother of Jesus. Mary is represented as playing a vital role in the establishment of the Church because she gave birth to Christ through whom was born the Church. Middle Ages: Here is witnessed the emergence of the Black Madonna. A suggestion is put forward that some Marian figures and paintings turned black due to exposure to smoke. Some of them, however, were painted black. In the past, black colour was used to paint images and statues of great importance. This is an attribute of pagan worship, where pagan gods were painted black, carried into Christianity. Another theory purports that the statues were painted black only in the 14th century to revive the Crusades. Another reason was that it was done to convert the dark skinned Moors to Christianity. Since black has negative symbolism, the Black Madonna would give solace and hope to sinners and those relegated to the lowest stratum of society. The Black Madonna of Rocomadour was the pilgrimage site for sinners who believed that their sinful state would be alleviated. Ecclesiastical prisoners were taken here and freed after they professed their repentance. Mary as the Black Madonna does not just represent the external darkness, but the spiritual darkness in humanity. Other examples of Black Madonnas are Notre Dame de Bonne Délivrance and the Marsat Black Madonna. The image of the Nursing Madonna is quite dominant in this period, with attention given to the physical form of Mary. The symbolism is about her caring nurturing nature as a mother. Our Lady of Orcival is an example of the Virgin in her majesty. The image of Maria Sapientia, or the Seat of Wisdom, has Mary sitting on a throne. It is a depiction of the wisdom that emerges from God and is made known through Mary because she bore Jesus. The 16th and 17th Century: This is the period of the Reformation and hence devotion to Mary and her images were influenced by the divide in the Church. The Roman Catholic Church began to focus on the maternal qualities of Mary, rather than her majesty as Queen of Heaven, making her far more approachable. There is more art showing Mary learning or reading, which hints at the Roman Catholic Church hitting back at the Protestants who gave little or no importance to the Virgin. There were strict checks on the use of correct doctrine in art during this time. In keeping with this, Michelangelo’s Pieta is said to have come under fire for depicting a far too young Mary, and because of her ungainly posture as she cradles the dead Jesus. Nevertheless, Michelangelo explained that virgins retained their beauty and youth longer and the reason for the posture is the attempt to realistically portray her trying to hold Jesus. Mary holds Jesus, who is part of herself, an extension of her own body as it were. The 19th and 20th Century: A group of artists who wanted to revive Christian painting was formed in the 19th century, called the Nazarenes. 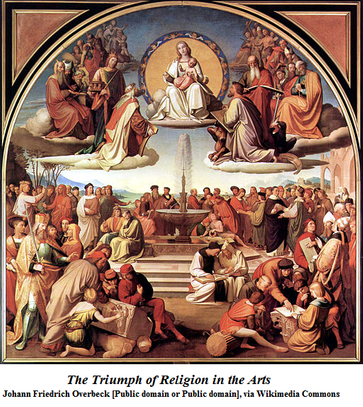 Of this group, Friedrich Overbeck painted The Triumph of Religion in the Arts, 1829 – 1840. The painting depicts artists, monks, the Emperor, the Pope and biblical figures with Mary as the Mother of God, seated on a throne above them. This is a representation of Mary as the Church. Rossetti’s The Girlhood of Mary shows Mary embroidering. The painting is full of symbolism, such as the palm leave and thorn on the floor to represent Christ’s Passion, the dove is the Holy Spirit, the books depict the three virtues of hope, faith and charity and so on. The 20th century time period evinced the production of artwork that was based on Marian apparitions such as Our Lady of Lourdes and Our Lady of Fatima. 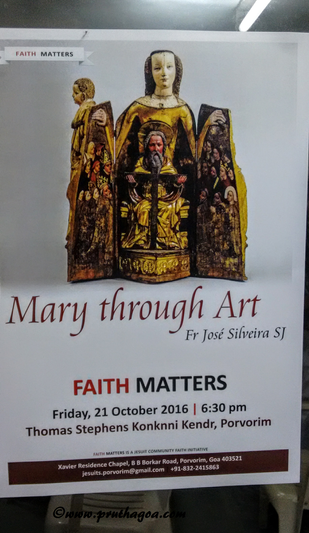 *This article is based on a lecture titled ‘Mary through Art’ by Fr José Silveira SJ at Konknni Kendr, Porvorim, Goa.